Move over summer squash, because your winter cousin has entered the picture. I’m so happy that butternut squash is back in season because it is my absolute favorite variety from this large and diverse botanical family. Sweet and nutty and comfortingly hearty, butternut squash is as versatile as it is tasty. It can be pureed into soups, mashed like potato, and even baked into sweet treats. But what I mostly like to do with it is simply coat it with olive oil, sprinkle it with sea salt, and roast it in the oven. Having roasted squash on hand has so many benefits. I like to add it to salads to bulk them up into a proper meal. Or for lunch, I pile it onto toast with some feta cheese sprinkled over. And if truth be told, sometimes I just eat it right off the oven tray. This pasta dish is one I’ve been making for years and years. It’s good midweek eating with a minimum of fuss. And the leftovers are always a welcome sight in the fridge. On a rimmed baking sheet, toss the peppers with 1 1/2 tablespoons of the oil and place in the oven. On a separate rimmed baking sheet, toss the squash with 1 1/2 tablespoons of the oil and set aside. After 10 minutes of cooking time for the peppers, place the squash in the oven. Continue roasting the vegetables for about another 15 minutes, until tender. In a large pot of boiling, salted water, cook the pasta according to the package instructions. Drain, reserving about 1/4 cup of pasta cooking water. Meanwhile, in a screw top jar, combine the garlic, lemon juice, and remaining oil. Shake to combine. When the pasta has been drained, add about 1 tablespoon of the pasta cooking water to the dressing. While the pasta is still hot, add the spinach leaves and dressing and toss to wilt the leaves and coat the pasta with the dressing. Add the roasted vegetables, zest, and ricotta and toss gently to coat and combine. Add more pasta cooking liquid if you think it needs it. Season the pasta to taste with salt and pepper, scatter with baby basil leaves, and serve. Calories 459, Fat 23g, Sodium 61mg, Carbohydrate 56g, Fiber 6g, Sugar 8g, Protein 12g. 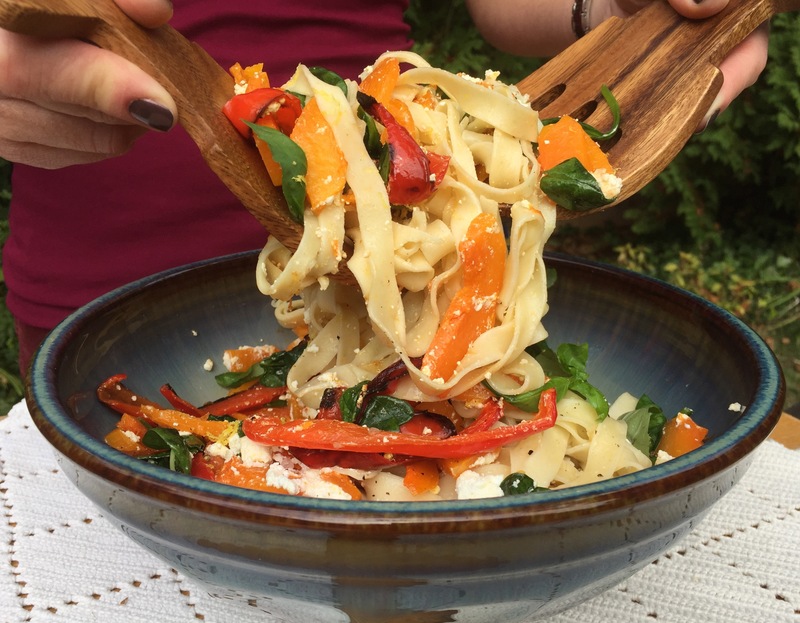 This entry was posted in main, side and tagged bell peppers, butternut squash, fettuccine, lemon dressing, pasta, ricotta cheese. Bookmark the permalink.